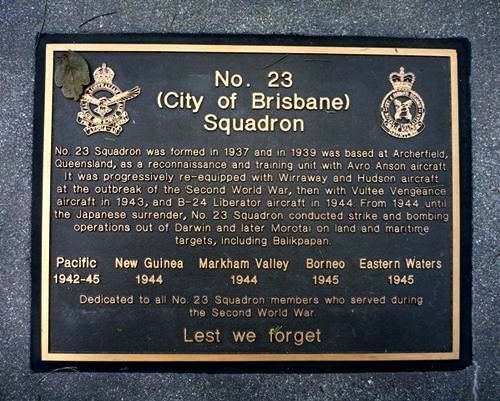 Plaque commemorates those who served with the No.23 (City of Brisbane) Squadron, Royal Australian Air Force during World War Two. No. 23 Squadron was formed in 1937 and in 1939 was based at Archerfield, Queensland, as a reconnaissance and training unit with Avro Anso aircraft. It was progressively re-equipped with Wirraway and Hudson aircraft at the outbreak of the Second World War, then with Vultee Vengeance aircraft in 1943, and B-24 Liberator aircraft in 1944. From 1944 until the Japanese surrender, No. 23 Squadron conducted strike and bombing operations out of Darwin and later Morotai on land and maritime targets, including Balikpapan.